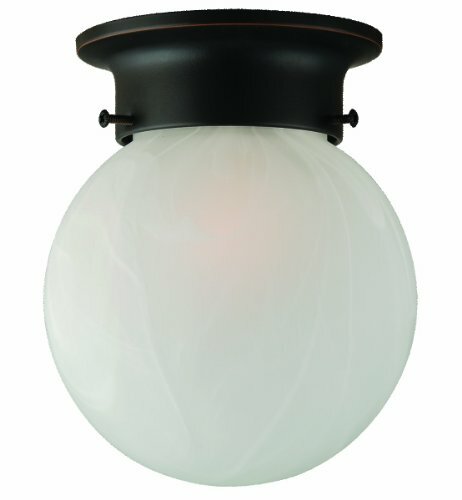 The Design House 514521 Millbridge 1 Light Round Ceiling Light has clean details for a modern accent to your home. Oil rubbed bronze finished formed steel frame and alabaster glass are elegant and stylish. This 1-light ceiling mount uses (1) 60-watt medium base incandescent bulb. As one of the most popular styles of light fixtures, ceiling mounts are suited for any room in the house. Measuring 6.75-inches (H) by 6-inches (W), this ceiling mount will add a subtle glow to any room in your home. This ceiling mount is cUL, UL listed and rated for 120-volts. Coordinate your home with the rest of the Millbridge collection which features a beautiful matching chandelier, wall mount, vanity and pendant. The Design House 514521 Millbridge 1 Light Round Ceiling Light comes with a 10-year limited warranty that protects against defects in materials and workmanship. Design House offers products in multiple home decor categories including lighting, ceiling fans, hardware and plumbing products. With years of hands-on experience, Design House understands every aspect of the home decor industry, and devotes itself to providing quality products across the home decor spectrum. Providing value to their customers, Design House uses industry leading merchandising solutions and innovative programs. Design House is committed to providing high quality products for your home improvement projects.